Downloading apps and files to your Android is the best way to add entertainment and functionality to your smartphone. But downloading isn’t always possible or convenient. Sometimes you are out of reach from proper Internet connection while other times you just don’t want to spend the mobile data but instead wait for Wi-Fi connection. So, how can you solve these downloading issues? The quick solution is to schedule your downloads. The Google Play Store is full of great apps to help you do just that with your smartphone. One of the best of these apps is ADM. It’s easy to use and you can save money & time. Here is a quick guide to getting started and a few tricks on how to make the most of this clever app. You can search for Advanced Download Manager (ADM) on Google Play and download it to your Android. The app is free to download and use. You can install it in a second and the app will be ready to use in no time. When you are done, you should find it on your application list – you can place it anywhere in your home screen. The app is popular and it allows you to download and schedule all sorts of files. You can download music files, video files or event documents and apps with this app. You can even prioritise files according to file type – this ensures your favorite files are downloaded first. It supports files up to 2 gigabytes so you don’t have to worry about the size. The interface is intuitive and easy to use. You definitely don’t need to be a tech genius to enjoy this app. When you are ready to start scheduling your downloads, you can open the ADM app. You’ll see a little ‘+-‘ icon in the right top corner of the app. You will need to have a copy of the download link and once you do, click the icon. This will start the download process automatically. In order to schedule it instead of just downloading it right there, you need to hit the pause button on the download. You can do this by clicking on the name of the file you’re downloading. Once your download is paused, you can swipe from left to right and get the setting screen brought up. On the Settings screen, you need to click on the Planning section. It will bring up a list of options and you need to click first on the Download Files. This ensures the download won’t start until your selected time. To set a schedule, you can see a spot for Start Time and Stop Time beneath the Download Files section. You can set any timeframe you wish. You can then just close the app – do not remove it from running in the background, however – and resume your smartphone use. The ADM will start downloading your file according to your settings. You can schedule multiple downloads with ADM in a matter of seconds. As the above shows, the whole process won’t be difficult. In addition, there are a few other clever tricks to keep in mind when using the app. You can choose the program to close after it has stopped downloading. This is a great way to ensure it isn’t running in the background and using battery charge for nothing. Furthermore, you can opt in or out of the Wi-Fi module and disable notifications if you want the app to stay silent. The app will allow the downloading process to occur in the background. If you do want to use the app while doing other things, you can – it might make the phone perform slower, of course, depending on your file size. While ADM is definitely the recommended app to use, you have other download managers available to use as well. Phone Schedule and Power Schedule can both help in terms of scheduling downloads. With these apps, you can control when a specific app is open. If you have music downloader or a video downloader for films, you could use this app to control when the apps are able to resume download in the background. However, these solutions can be trickier to set up to using ADM. If you don’t want to spend a lot of time scheduling your downloads, the ADM app is definitely worth downloading to your Android phone. 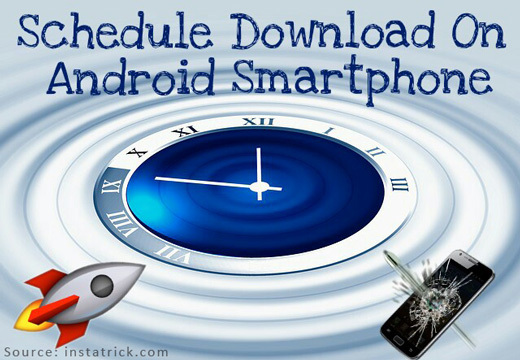 The above will help you schedule downloads on your Android with the help of the ADM app. But what about the cost? If you are still worried about the cost of downloading huge files, you should look into your mobile contract or home Wi-Fi connection. You can find great deals with sellers like Red Pocket Mobile and T-Mobile. You should compare different options and your data needs to find the right solution. So, sort out your data connection, download ADM on your Android phone and make scheduling apps and files easier than ever!